What do we mean by colour combinations? Well these are kitchens that have added extra interest through combining different colours and finishes within one scheme. This can help differentiate zones within the kitchen or simply tone down what could otherwise be a very modern or traditional space. What could be a very stark modern kitchen in the Tempo range has been lifted by the use of zebrano doors amongst the white. Still modern in feel, it gives the design interest and contrast and looks very effective. The chrome in this Image kitchen retains the high modern design but offers an accent that sets off the black gloss well. This Gloss kitchen in Alabaster is toned down with the addition of oak high cabinets which look very natural juxtaposed with the clean lines of the rest of the kitchen. The Avola kitchen is more subtle, combining champagne and truffle doors and then picking up the dark brown of the truffle in the worktops creating some rich tones and subtle variation. 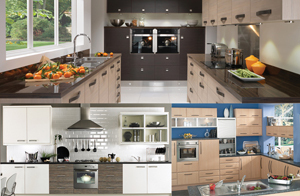 You can browse these and other colour combinations kitchens in our Kitchens by Colour gallery. For help planning your kitchen why not book a consultation? 0 Responses to "A closer look at our Kitchens by Colour: Colour Combinations"